Hey everyone, how you all doin? Things are going really well here. Laurie and I are healthy and happy and business has never been better. I have a lot to bring you up to date on, so here goes. 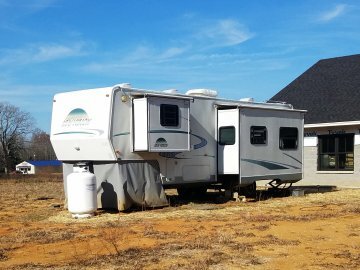 We're still living in a camper out behind our new building here in TN. But don't feel bad for us - it's quite a nice camper, such as it is, and we are quite comfortable most of the time. 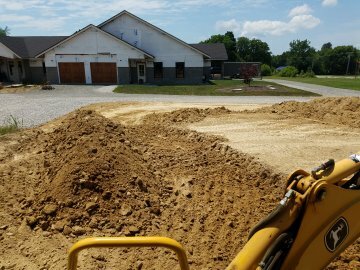 It's just a slow process for us to build this big new place, with limited time and funds, and with such a high standard of construction quality that we strive for. It will be worth it in the end. Laurie is not as thrilled with the whole thing as I am, but she is a good sport, for sure. I absolutely love the new place, even in an unfinished state. I'm starting to get caught up on the backlog of work I had earlier this year, and although I still have a ton of work going on at the shop, I'm in need of more orders. So please put me to work. I'm at your service. AXPONA 2018 was very successful for us. Volti Audio was there with BorderPatrol Audio and Triode Wire Labs . 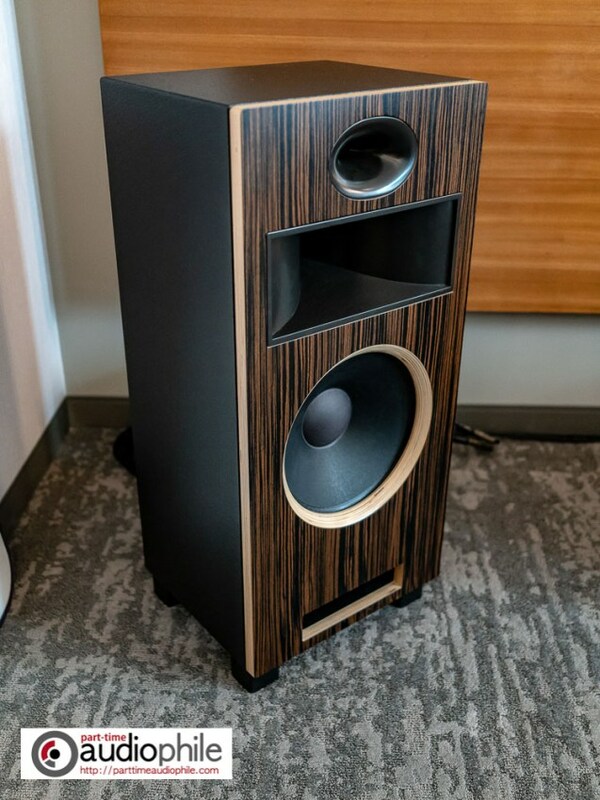 We were showing a set of Rival speakers with painted cabinets, Ebony veneered fronts, exposed plywood edges, and the new external crossover option that we are now offering for the Rivals. The new venue for AXPONA is big and very nice, and we're looking forward to next year already. 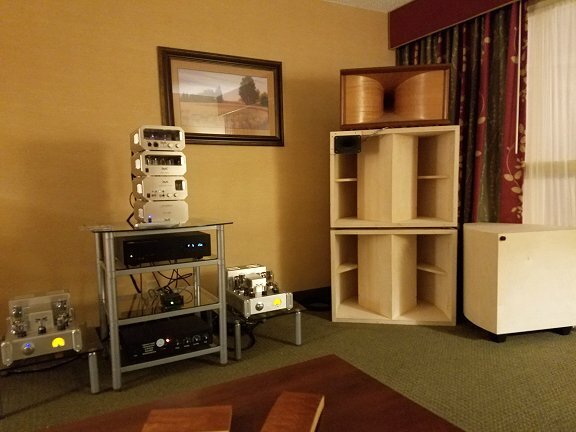 If you've not been to an Audio Show, or not been lately, you really must. They are just such a blast! Come get me in my room and we'll go explore some of the other horn speaker systems at the show just for fun. 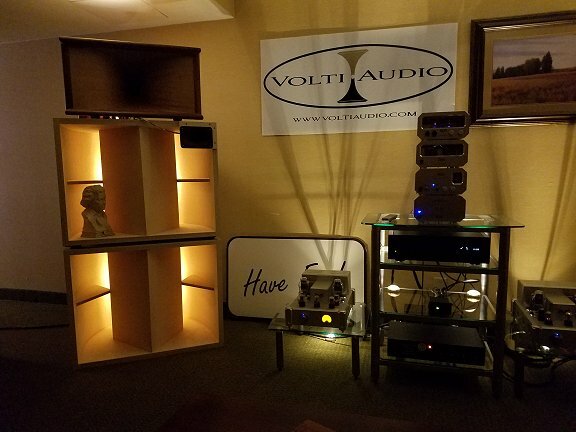 "Show after show, the Volti Audio room is one of the best. 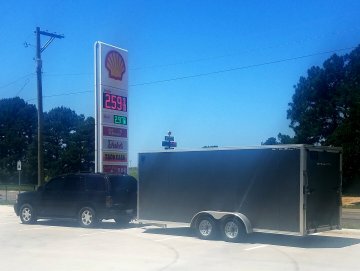 It was no different here as they paired with BorderPatrol Audio electronics and Triode Wire Labs to make great sounding music." I decided to go to the Lone Star Audio Fest this year - Dallas, TX. 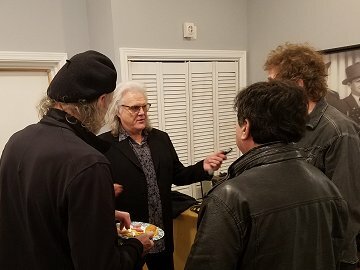 Dave Thompsen, a regular at LSAF (always has his gear in several rooms there) has been after me for a while now to come to LSAF, and now that I'm in TN, and only a day-drive away, he's finally talked me into it. LSAF is really more of an audio club get-together than it is an audio show. At least that's my take on it. Not a whole lot of traffic, but the guys that go to this show are very knowledgeable. 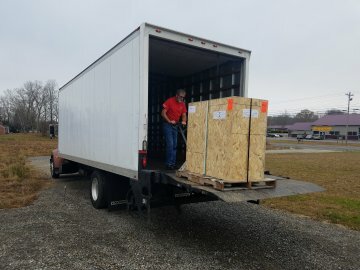 LSAF was just a couple weeks after AXPONA, and I sold the show speakers that I used at AXPONA, so I didn't have any finished speakers to bring to the show! Knowing the casual nature of the show, I decided it would be ok to put something together out of parts and pieces I had kicking around the shop, and just go to have some fun. So this is what I ended up with. Two Vittora bass horns per side, Lavera midrange horns (custom horn I built years ago - Tractrix - 2" throat), Vittora tweeters, modified Vittora crossovers, and two Vittora ELF cabinets. It was a lot of fun. And by the way, you Texan's sure do know how to cook beef! 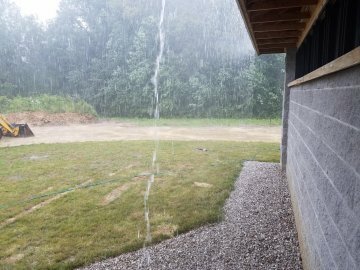 I'm sorry to say that Rocky Mountain Audio Fest is not on the schedule again this year. The remodel of the hotel has left the regular sized rooms too small for my liking. We tried to get a larger room, but could not. We'll try again next year. You should all write to them and tell them it's time for a venue change so we can have a normal sized hotel room to show systems in. If nobody says anything, it just keeps going. 10' wide is just not big enough for ANY system to be properly set up in. What happens if I spend the money on the show, and I end up making a medium quality sound in my room? Maybe I'm overthinking it, but I have other places to spend my marketing dollars, and I don't think it's worth taking the risk on a 10' wide room at RMAF - as much as I miss going there. Go to the Capital Audio Fest Website for all the info. Guess who I'll be teaming up with at the show? No, it doesn't get old. We'll keep showing together as long as we're able, because we want as many people as possible to come hear and enjoy the synergy, the excitement, and the pure musicality of one of the finest Stereo systems you'll ever hear. The Rival speakers we're using at CAF are for sale right now at a special show discounted price. I'm hoping I'll be able to sell them by the end of the show and then deliver them to my customer after the show, before I head home. The Inaugural Florida Audio Expo is being held in Tampa, Florida February 8 - 10, 2019. The Triumvirate will be there! If you'd asked me about these things a year ago, I did not have the experience to share any recommendations one way or the other. I think I would have guessed that the differences were so small that it really didn't matter. I would have been wrong. Now that I've had a chance to hear the difference between single wiring a set of speakers or bi-wiring, there's no question in my mind that I'll choose bi-wiring every time. Same goes for taking the crossovers out of the speaker cabinets. Of course these things always require some explanation as to the degree of improvement. We all use different words to describe sound, and we all have different experiences to draw from when it comes to our impressions of "improvements" in sound quality. I'll explain it this way. 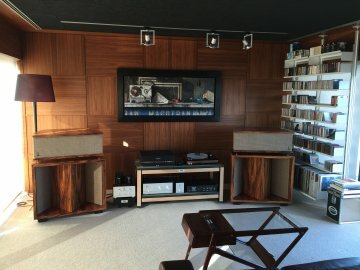 If you're able to sit in front of a high-end system, that has already been refined to the point where it can be considered one of the finest stereo systems in the world, and you can hear a noticable difference in quality (whatever words you want to use to describe that) between single-wiring and bi-wiring, you've got something substantial enough to really take notice. It is exactly this experience that I have had several times now. 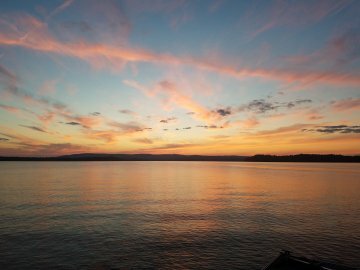 We all know about the law of diminishing returns on our investment in our systems. Once you've reached a very high level, it takes a great deal of money to improve it even just a little bit. Ordering external crossovers as an option, or ordering a bi-wire set of speaker cables to replace the ones you've got, are actually reasonably priced (in the high-end world) examples of upgrades that can improve your enjoyment of your stereo system. This is a good opportunity for me to seque. Christmas is coming, if you need an excuse. Or, if you've just got the itch to do something with your system - I'd like to remind you that Volti Audio is more than just a speaker manufacturer. I really enjoy working with my customers to help them build or improve their systems, and I've had the opportunity to do so quite a few times over the last couple of years. My offer to you is this - I will provide you with a very high level of personal service, like what you would expect (but don't always receive) from a very good brick and mortar Stereo Store (are there any left?). My recommendations will be based on my own experiences, as I don't sell anything I haven't used myself. You will not be charged for my services and you will never pay more for a piece of equipment invoiced through Volti Audio than you would buying direct. 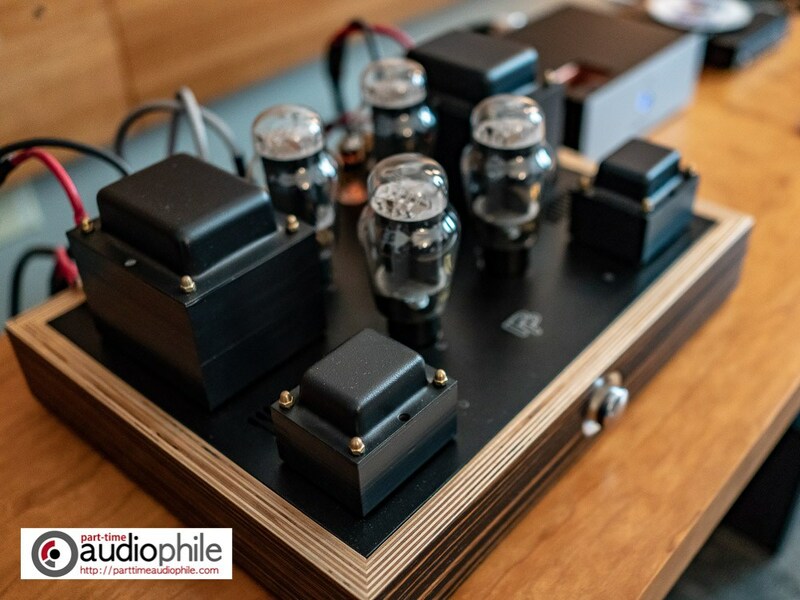 I can help you improve the quality of your system with Triode Wire Labs cabling, Vinnie Rossi electronics, reasonably priced Tube amplifiers from Amps and Sound or Quicksilver, or the very best tube amplifiers from BorderPatrol. How about an UberBUSS for your system? These are not just any old power conditioner, robbing your system of dynamics. 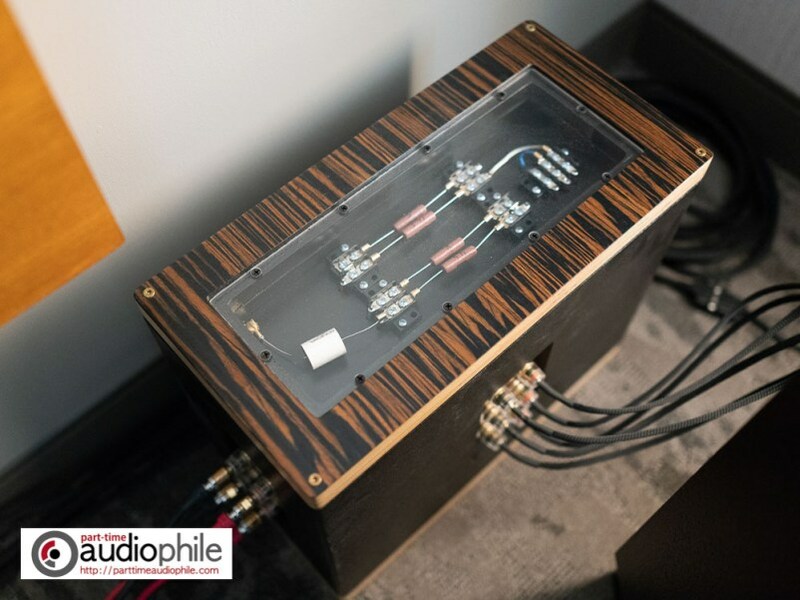 Oh no, the PI Audio Group UberBUSS provides power conditioning that will likely improve dynamics, as it lowers the noise floor in the system. It's a must-have in my system. Or how about a new DAC? The BorderPatrol DAC starts at just $995, and it's simply the most musical sounding digital I've ever heard. Notice I didn't say "analogue" sounding? That's because it's better than analogue in many ways. If you want analogue sound, then get an analogue source. But if you want great sounding digital, get a BP DAC. Here's a link to the Volti Audio electronics page. There have been enormous changes in the Audio Business over the decades. It used to be that we had one or two dealers nearby to us, and we would demo what they had on the floor and make our choices based on what was available. Nowadays, audiophiles have more choices than ever, just a click away on the internet. But how can you possibly hear everything there is available to you? Even if you had several dealers nearby, you still can only hear just a fraction of what is out there. Sure, you can hear a lot of things at an audio show, and you should. But some of us have a hard time making decisions based on such a short demo, in less than ideal conditions. There's always plenty of things written on the internet and in magazines about any particular piece of equipment, but that's not always enough to really make a firm decision on either. But most of us do make our decisions on what to buy for equipment using one or more of these pieces of information. 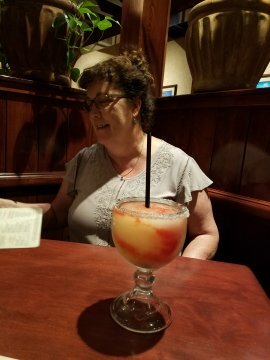 What I hope to do is help my customers with their choices by providing them with one more experienced opinion, specifically geared towards a system built around high-sensitivity speakers. Before I tell you about a couple sets of pre-owned Vittoras for sale, I want to mention that it is time for a price increase on the Vittoras. It's been a few years now, and my costs have crept up a bit over that time. I need to stay profitable enough to be sustainable, otherwise I won't be here at all! So look for a price increase at the start of the new year. 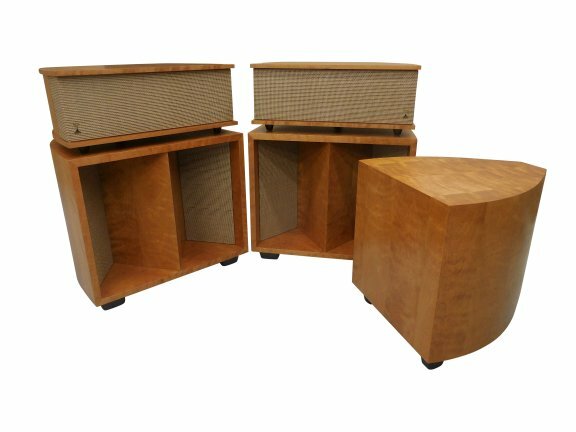 I have a limited number of Vittora cabinets built that I will sell at the old pricing between now and the first of the year. First come, first served, so if you're thinking about Vittoras, I would encourage you to get in before the price increase. The impending price increase will make the prices on the pre-owned Vittoras listed below look even more attractive. The first pre-owned set of Vittoras I want to tell you about are sitting at my shop right now. They are in near mint condition, veneered in natural figured cherry, with the cane-style grill cloth. They come with one curved-sided ELF cabinet and a Marchand MB42 amplifier/processor. 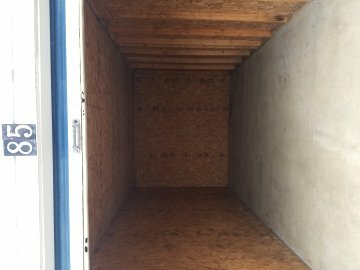 They are current model, have been thoroughly tested and cleaned, and I built new crates for them to be shipped in. Available at a nice discount off the new price, please email or call for pricing. Delivery available, and at a very reasonable price if delivered during my trip to or from Capital Audiofest this November. Buy these Vittoras and have me stop by your place to set them up. What fun! You supply the beer. The next set of pre-owned Vittoras I want to tell you about are located in Spain. They are veneered in Rosewood with cane-style grill cloth. 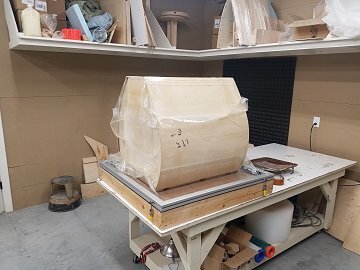 My customer is moving from a suburban home into a much smaller home in the city of Madrid, and so he will be downsizing to smaller speakers (I believe he will be buying Rivals actually). But the Vittoras are set up now and will remain set up for quite some time for demos. 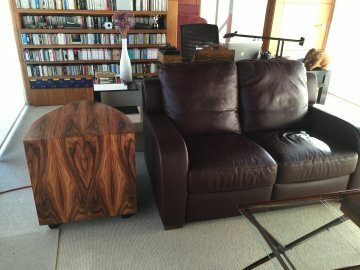 I am told that sales with the EU incur no duties or taxes, so this is a nice opportunity for those of you in Europe to go hear and buy a beautiful set of Vittora speakers at a discount off the normal new price. 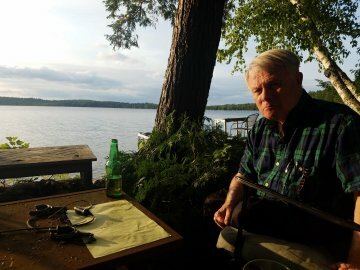 My friend Lionel at his lakeside home. Looks salty doesn't he? 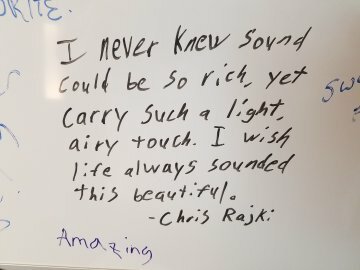 Just as I was wrapping up this newsletter, I made a sale for a pair of Rival speakers. I wrote an email reply to my customer and I thought - what the heck - I'll copy and paste it into the newsletter. My subscribers will find this interesting. I must say, your prices are fantastic. Gary recently said that he feels the Rival is currently the best value speaker in the world. And that man does not do hype. I hope you're making money out of it! Received your deposit, thank you. I have attached an updated invoice showing the payment made. I also simplified the wording on the invoice regarding the production time, and I think it reflects what we've discussed. Please take a look and let me know. It's nice to hear (for a change) when someone thinks my pricing is fair. 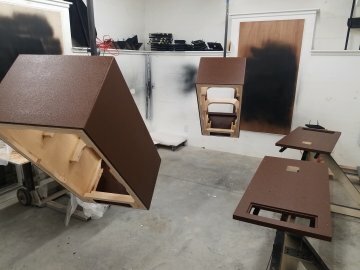 People don't realize the work that goes into building a product like this, by hand, one at a time, or the cost of running a small business like Volti Audio. It's very different from making millions of I-phones for instance. 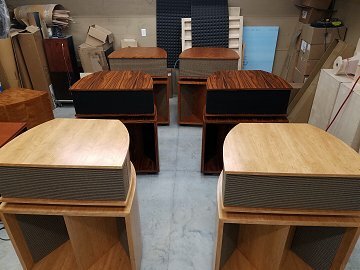 If I could sell hundreds of speakers, and I wanted to operate such a business, the production would be quite different than what I have going, and the price would be different as well. But I'm at a point right now in my life where simpler is better. I like that fact that every bit of the construction of your speakers will be done by me, and I suspect you do too. I can make a decent living at it as long as the sales continue - that's always the part that worries me. I only need to sell 10 - 12 sets of speakers a year (with a couple Vittora sales included), and along with the www.klipschupgrades.com business, that keeps me plenty busy - and it has been our sole income for the last four years, so it seems to be working. But it's harder than you think, to sell 10 sets of speakers each year, every year. This is why I appreciate every sale so much - Thank you John. When I fill out the shop work order for your speakers I'll send you a copy. That's it for this edition of the Volti Audio Email Newsletter. Thank you for your support, and until next time, trust your ears and Have Fun!